So this happened a bit ago. Awhile ago. Okay, about fourteen years ago. So why am I writing about this right now? Well, I know that I wrote about this back then when it was fresh, but it was at a site of mine that’s no longer around. See, I got to thinking about the whole situation a couple of weeks ago and looked up my old “boss” – and I got annoyed by it all over again. And here we are. This woman owes me $3000 for the work I did for her. She owes at least two other people that I know of money from this “business” too. There were a couple of other people floating around as well, like a slimy-looking business partner (I don’t remember his name), but I don’t know what they were getting paid, if anything. When I met her, she was going by Tammy Camper and was trying to get her TammySays! radio show off the ground. Now she’s married and goes by Tammy Williams or Tam Williams. Her self-named hashtag she uses all over online is #thatstam. She currently has a new venture called She’s It, some app she’s now trying to get off the ground that she says will be worth millions in a couple of years. Gee, that sure sounds familiar. It all started when I replied to an add on Craigslist. I had various skills, so I’m not sure if I applied to be a web designer, writer, or editor. We all met in some hospital boardroom, and I think she invited everyone who applied so that she could meet them face-to-face first before whittling down to her favorites. Mark was so skeptical of this whole thing from the start. I wanted it to work out because I really liked the work I did, and I got along decently with the others she hired too. She got an office space in Moorestown, NJ, and I loved having my own office after years of sharing spaces. I don’t know if the actual recording studio was ever finished before the whole thing shuttered or not. Anyway, my first thought that something was off was when she gave me her credit card and told me to order computers from Dell, and they told me they couldn’t send any because she still owed them $2000. I think the customer service rep said it was from a bill for previous computers that weren’t returned. I, obviously, had to hand that call back to her. Before long, we had computers. The issue was resolved, but I had a funny feeling in my stomach after that. So she had assembled a small team, and we worked loooong into the nights, trying to get her website, newsletter, and such just the way she wanted it to be. At one point, Mark was getting nervous that I wasn’t being paid what I was owed. Despite that, I kept working. She fed me some garbage about how I was going to be the Gayle to her Oprah after she made it big. I went into the office a few times a week and worked from home the rest. She had me set up the voicemail for the office because I had the most “Caucasian-sounding” voice out of the others. There came a point when two other employees started asking each other – and me – if we had gotten paid. She owes one something like $1700, but I don’t know how much the other person wasn’t paid. And mine skyrocketed to that $3000 total I mentioned above. The three of us decided we were done doing work for nothing. She and the business partner asked us employees to attend a meeting where they promised investors were forthcoming and that we should sit tight – again. So we quit, but I know there was one other guy who did keep working for her for a bit. Anyway, I wanted it to work out, of course, which is why I held on for so long despite not getting paid. But I walked out of that meeting. And, immediately after that, I was persona non grata. I had to set up a time to come clean out my office when one of her friends/employees could supervise me. Hahah. Like, really? The funny thing is that the guy she sent to chaperone me told me he was going to take the computers that were in the office (to keep or sell, I don’t know) until I told him they weren’t hers to just go crazy with. I explained the story about the $2000 Dell computers and said these were probably expected go back too. A few weeks later I listened to the office voicemail and heard two messages left by people who had appointments with her to come see the space (maybe even record with her? ), but she left them hanging and never showed up or bothered to call them to cancel. We were all, Tammy too, copied on most of what was above. She mentioned her lawyer’s name as he was copied on her stuff too. At that time, it seemed like he was a young guy with just a few years out of law school who specialized in entertainment law. Since then, he’s had his law license suspended twice. You know what they say: like attracts like. I’m sure she’s made a lot of promises to a lot of people in the past and that things could have all blurred together for her. 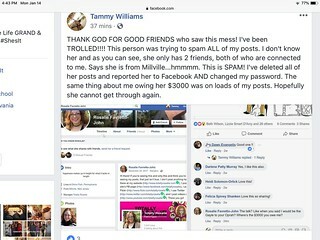 But as soon as I said TammySays!, she should have instantly remembered who I was; however, she told me to “cease and desist” from commenting on her various social media accounts because she doesn’t know who I am or what I’m talking about. Uh, okay. Also, if you google “TammySays radio,” there are still a few sites out there that talk about her show. Prior to founding this She’s It She app, apparently she had a management consulting firm called Strategic Transformation Partners. The website description says, “My management consulting firm helps business leaders make better decisions, deliver improved business performance and take advantage of windows of opportunity even when the course of action isn’t clear. Our clients value our ability to gather and analyze large volumes of information, identify critical insights and develop the optimal business strategy supported by clear, actionable recommendations. I particularly like working with other women business owners and minority business owners.” The link to this site is long dead, just like the one for her radio show. I wonder if people lost money on that too. It just kills me that she’s a self-described champion of small business and talks about women empowerment and women doing right by women. How about you do this woman right and pay her what she is owed? I can’t believe she’s allowed to speak year after year at various small business conferences, like recently at the Richmond Women’s Health and Fitness Expo. What kind of wisdom does she think she can impart? I just don’t get it. Now with this new app of hers, she’s expecting big things, of course. I wonder who she got to invest in this thing and if she’s paying absolutely every single person who has done work for the app, its site, and so on. I hope they’re not doing it for future pay or are doing it for free for “exposure” or some such. The Facebook likes for her site and app don’t match the twitter and Instagram follows, so I’m guessing she bought the likes to pad its supposed success. A recent article written about her says the release of this newest endeavor took five years and $300,000. Where did that money come from? I guess she got luckier with the investors this time around. Just be forewarned that working with her is a risk. And, if things fall apart, she will act like she doesn’t know you and just move on to the next thing.